At noon on that historic day the people of Rye, stood at the memorial in the churchyard and watched the Queen talking and smiling happily with John Button and Alderman Hacking, it was as though there was a contact between that radiant person and everyone around her. This was our Queen. not a picture on a stamp or a profile on a coin, but a real and wonderful person—here in Rye. In the Souvenir issue of “Rye’s Own” appeared the story and pictures of that great occasion. Rye’s Own, with the help of all the members on it’s staff and other volunteers, captured the best and most representative photographs taken on the day. Many Ryers have kept and treasured their copy to this day and show it to show it to their children and their children’s children. The Rye’s Own camera team got a special mention, the planning and preparations made to get their pictures would make a story in itself but suffice to say that Heather Bottomley, Elaine Peprell, Howard Coster, Clive Wall, Jim Hollands and Mr. Collett (Rye Camera Club) did a very good job under difficult conditions. The Movie Society were out in force, using no less than nine cameras to record a complete film of the Royal visit. The film was shown at the Society’s public film show, probably early in the following Year. The film is in colour and runs for about 15 minutes. 700 people watched it in five separate showings and it is included on this post for you to watch at your leisure. 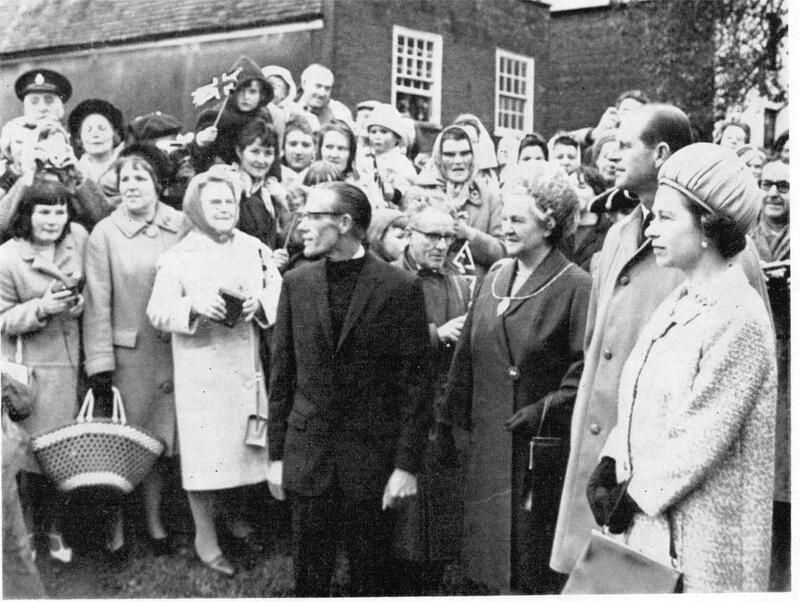 At 11.37 a.m. on that Friday, in October, Her Majesty The Queen, accompanied Royal Highness The Duke of Edinburgh, arrived at Cadborough Farm in the Borough of Rye. Not since the far off days when the Ancient Town of Rye was one of England’s most important naval ports has there been an occasion like this. At Cadborough Farm, the home of The Mayor and Mayoress of Rye, Alderman and Mrs. W. J. Hacking, The Royal Party were received by the Lord Lieutenant of Sussex who presented the Mayor and Mayoress and the Mayor’s Daughter-in-Law, Mrs. W. R. Hacking. Her Majesty was then shown the racehorse Augustine. This was really a re-introduction, as the horse formerly belonged to her. A gelding by Auricle out of Young Entry and a full brother to Apprentice, winner of last year’s Goodwood Cup, Augustine was given to Queen Elizabeth the Queen Mother by Her Majesty and was trained by Jack O’Donohue at Reigate. When Miss Julie Barlow, who worked at the Reigate Stables, left in 1964 to marry the then Mayor’s son, Mr. W. R. Hacking, the Queen Mother gave permission for Miss Barlow to take the horse with her. Since then rider and horse have been successful at many Ladies’ Point-to-Point races. 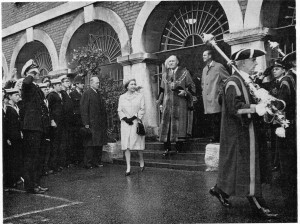 The Mayor preceded the Royal Party to the Town Hall, where he was robed in his mayoral gown to receive Rye’s Royal visitors. 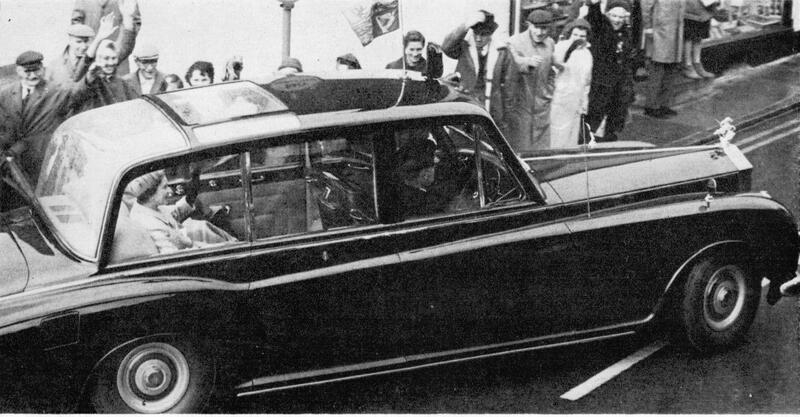 The Queen’s car made its way through flag waving lines of people by way of Udimore Road, where the Badger Gate building was pointed out to The Queen and Prince Philip, they waved and smiled to Rye’s Senior Citizens as they passed. In Ferry Road they slowed for a moment near the Primary School and waved to the children lining the route. Rye Grammar School pupils waved and cheered as the car flying the Royal Standard drove through Cinque Ports Street. At the Landgate, the historic gateway to Rye, a great crowd who had waited in the rain were rewarded with a glimpse of the Royal couple as the car passed through the well known landmark. On Hilder’s Cliff children from the County Secondary School and the Collegiate School lined the Royal route. Through the High Street and into East Street the flag waving welcome was continued. Then on to Market Street and the Town Hall. 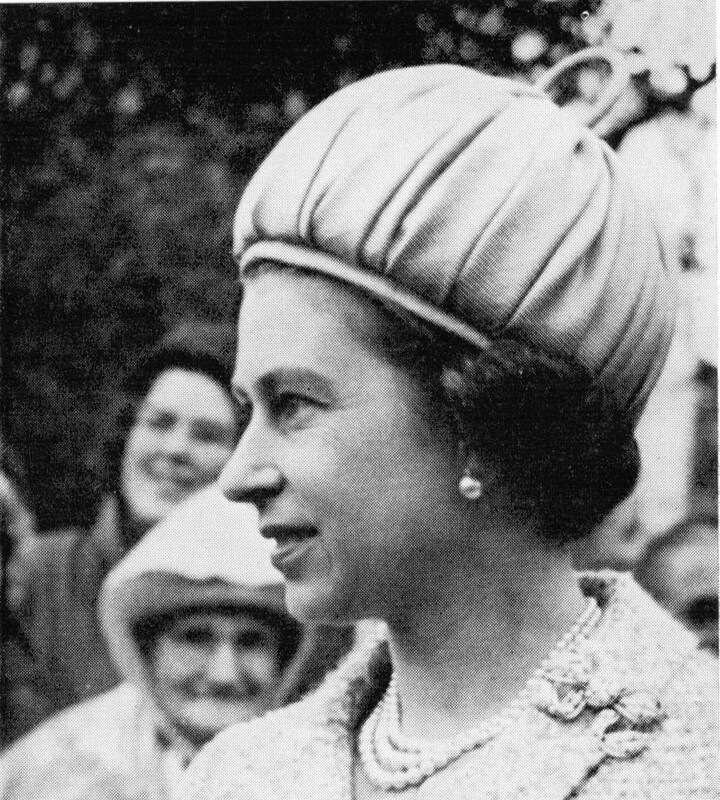 As Her Majesty alighted from the Royal Car the cheering crowd could see she was dressed in a pink tweed coat flecked with white, over a pink dress. She wore a close fitting hat in matching pink, with black accessories. Prince Philip waved his hat to the crowd as the Royal Party walked into the Town Hall. The Mayor presented the Town Clerk, Mr. J. D. Smith and Mrs. Smith before escorting the visitors up the stairs to the Council Chamber. The moment Her Majesty entered the Town Hall the Royal Standard was flown from the Flag Staff. Two faces were missing among the Aldermen, Councillors, and officials who waited in the Council Chamber for presentation to Her Majesty the Queen—Councillor Macer was in Hospital recovering from an operation. Alderman Candler tragically died on Wednesday morning, he was Mayor of Rye and Baron of the Cinque Ports in Coronation year and was present in Westminster Abbey for the Coronation. After the presentations The Queen and Prince Philip signed the visitors book and photographs of themselves. The shower had passed over by the time the Royal Party came out of the Town Hall on their way to The Church. 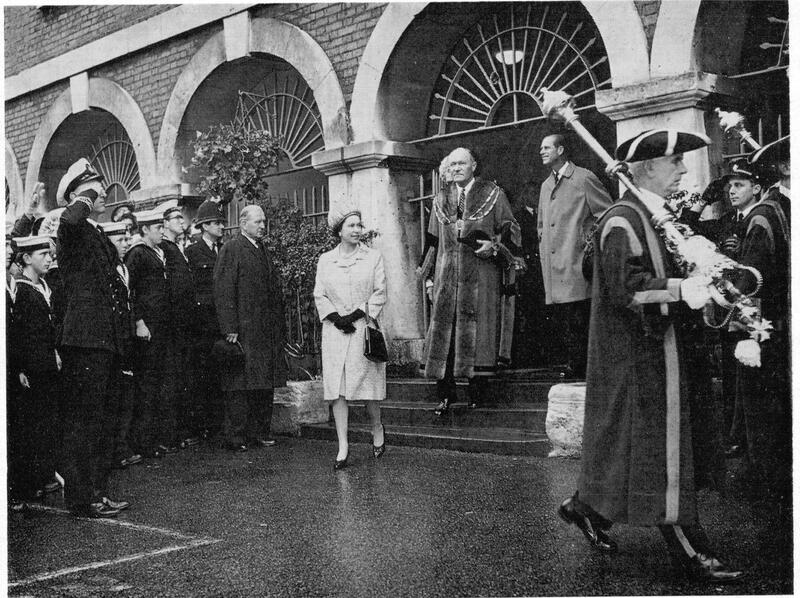 Macebearers, Mr. Bert Polley and Mr. Fred Parris led the procession followed by the Queen accompained by the Mayor and Prince Philip with the Mayoress. Officers of the Sea Cadets, The Air Training Corps and the St. John Ambulance saluted as the Sovereign walked past. As Her Majesty left the building the Royal Standard was struck and replaced by the Union Jack. At the North Door of St. Mary’s Church the Mayor presented the Vicar, Reverend J. E. R.Williams and Mrs. Williams and Wardens, Mr.F. E. Orford (Vicar’s Warden) and Mr. E. J. Hickmott (peoples warden). At the South Door, the girls and boys of the Scouting movements and the Red Cross lined the pathway and waited expectantly for the Queen and the Duke of Edinburgh to appear. They had not long to wait, the procession passed through the Church and out into the picturesque churchyard in which this great church, that was once called the cathedral of East Sussex, stands. Prince Philip found time to speak with several children as the procession made its way to the memorial. At the War Memorial, Mr. John Button, a fisherman who has lived in Rye all his life, waited to greet Her Majesty with a gift of Rye Bloaters. Prince Philip asked Mr. Button what should be eaten with Bloaters? John replied that the best way of eating them was with bread and butter, anything else might spoil the flavour. 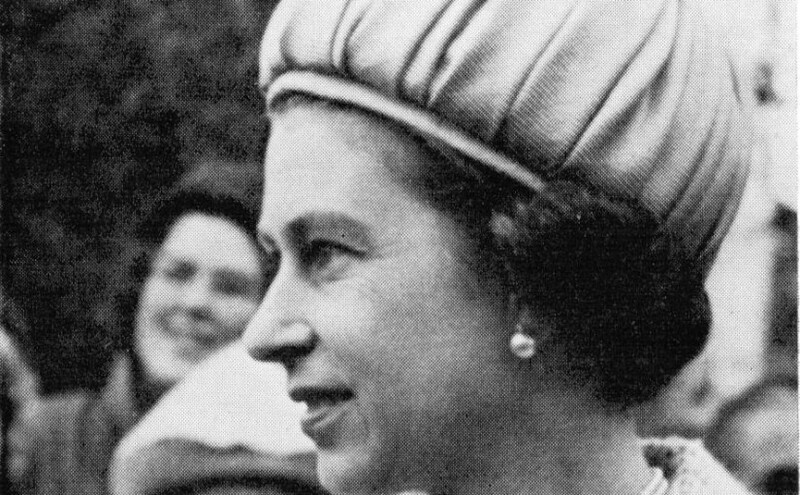 Her Majesty was interested in a fishing boat coming up the Rother, she asked Mr. Button if it was a Rye Trawler and he proudly told her that it was. As the Royal couple stood talking with Mr. Button and with the Mayor and Mayoress, Prince Philip suddenly took a nautical interest in his surroundings and pointed out Rye Harbour. No doubt he remembered if from his sea going days. The Church clock had struck twelve and the time had come for departure but the Royal pair seemed to be in no hurry to leave the Ancient Town. 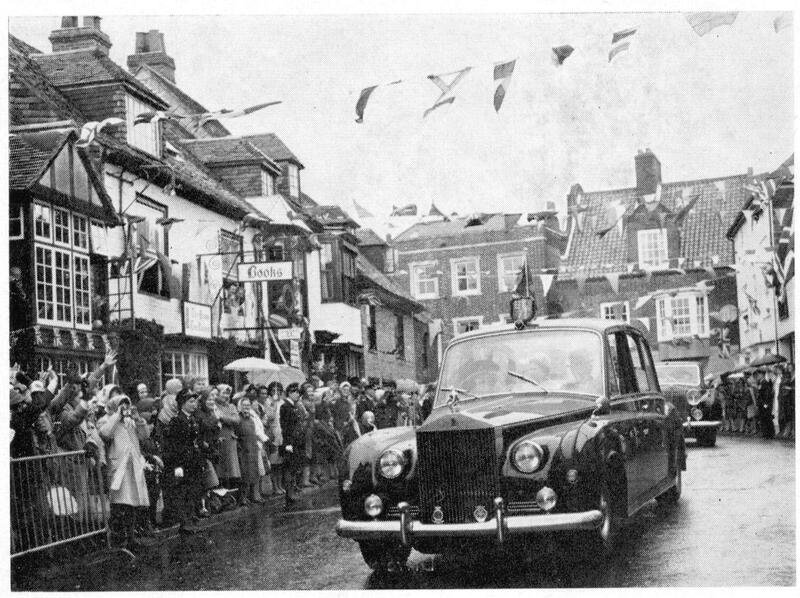 The ride through Church Square, West Street and down Mermaid Street over Rye’s famous cobbles was probably the most memorable part of the visit for The Queen and Prince Philip, they laughed when their driver had to reverse to get round the corner from Church Square into West Street and they seemed to be really enjoying the bumpy ride down flag bedecked Mermaid Street. Then they were gone. . . off towards Winchelsea and Hastings. For them Rye was only a small part of their East Sussex Visit, a visit which started at Battle and ended at Eastbourne. And remember, the day after these wonderful people concluded their arduous visit to this part of England duty carried them to Wales . . to Aberfan . . Elizabeth II is the Queen of Wales too. Copies of photographs appearing in this issue can be ordered from Rye’s Own Office.